‘Tis the season for baking and holiday crafts! Christmas is the perfect time to put our creative skills to the test, and a holiday contests is great competitive atmosphere to test our skills, so why not participate in one and join in on the spirit of the holidays. Memorablegifts.com contest always strive to incorporate a memorable theme, and this is year is no different. Make your Christmas memorable, by entering in our contests located in our Facebook Page it’s easy and fun. The first contest is a Christmas drawing contest for the kids, submissions must be made through the event page on Facebook. Holiday drawings are not uncommon — many children spend their time during the fall writing wish lists and drawing pictures of Santa Clause — and make great and unique Christmas decorations. We wanted to make it simple for parents, grandparents, uncles, aunts, brothers, or sisters to be able to submit their child’s Christmas drawing, so we went with a Facebook contest. It is very easy all you have to is take a snapshot of the Christmas drawing, and upload it to our events page. 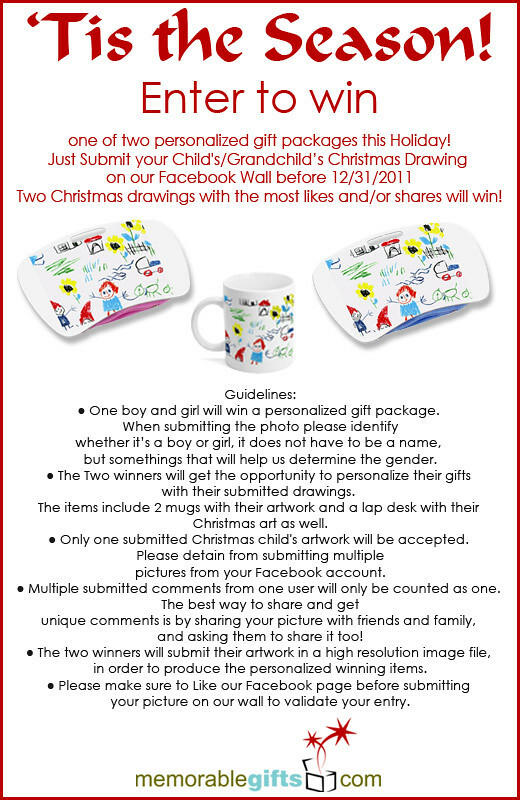 One boy and one girl will have the chance to win a personalized gift package with their drawing printed on the items. As mentioned above, entry is very easy. In order to enter, participants must like our page and upload a picture of their creative Christmas drawing or baked good. Our second contest is a good ol’ fashioned baking challenge! It can be any type of baked good, but it must be themed around Christmas in order to qualify. Bake whatever your heart desires; Gingerbread houses, gingerbread man, pumpkin pie Santa Clause’s, Nutcracker muffins or anything related to Christmas. All submitted photos of the baked good must have a Christmas theme, participants will get a chance to win one personalized gift package. Gift package includes a personalized cookie jar and personalized apron. Both contests end at 11:30pm on December 31st, 2011 don’t wait to share your uploads with friends and family! The uploaded image with the most comments or likes wins! It only takes a 2 minutes to upload and share! Create a memorable moment today with memorablegifts.com! One boy and girl will win a personalized gift package. When submitting the photo please identify whether it’s a boy or girl, it does not have to be a name, but somethings that will help us determine the gender. The Two winners will get the opportunity to personalize their gifts with their submitted drawings. The items include 2 mugs with their artwork and a lap desk with their Christmas art as well. Only one submitted Christmas child’s artwork will be accepted. Please detain from submitting multiple pictures from your Facebook account. Multiple submitted comments from one user will only be counted as one. The best way to share and get unique comments is by sharing your picture with friends and family, and asking them to share it too! The two winners will submit their artwork in a high resolution image file, in order to produce the personalized winning items. 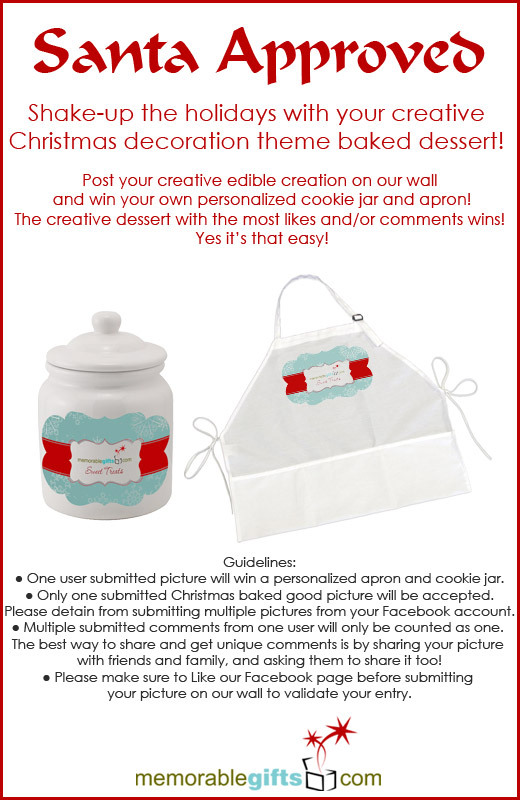 One user submitted picture will win a personalized apron and cookie jar. Only one submitted Christmas baked good picture will be accepted. Please detain from submitting multiple pictures from your Facebook account. Please make sure to Like our Facebook page before submitting your picture on our wall to validate your entry. If you have any questions you can ask here or on our wall.